Adam Devine and Rebel Wilson shared a passionate smooch onstage while accepting the 2016 MTV Movie Award for Best Kiss. Amber Rose and Amy Schumer spontaneously steam up the 2015 MTV Movie Awards when they're caught in the audience by a roving Kiss Cam. When Dave Franco, Seth Rogen and Zac Efron gave random audience members the chance for an on-stage kiss at the 2013 show, the golden ticket with Rogen?s name on it ended up under his mom?s seat. That didn?t stop the funnyman from embracing the moment. After getting a quick peck on the cheek from Zac Efron, Rebel Wilson pushes her luck and requests an Australian kiss -- "a kiss down under." Kristen Stewart, left to her own devices without co-star Robert Pattinson, gives the audience a self-makeout show as she accepts the 2012 award for Best Kiss. Robert Pattinson and Taylor Lautner take bromance to another level with an impromtu smooch at the 2011 Movie Awards. Robert Pattinson goes in for a smooch with leading lady (both on and off camera) Kristen Stewart as they accept their Best Kiss win at the 2010 Movie Awards. Yes, that is Sandra Bullock celebrating her 2010 MTV Generation Award win with Scarlett Johansson in the best possible way. You're welcome. In 2010 Jonah Hill and Russell Brand couldn't wait to swap some spit and make their bromance known as the Kiss Cam roved the audience. After winning Best Kiss in 2009 Robert Pattinson decided to get up close and personal with co-star Kristen Stewart. Close your eyes this won't hurt a "bit." Robert Hoffman and Briana Evigan "step up 2" the stage to accept their Best Kiss golden popcorn in 2008. Jessica Biel and host Sarah Silverman decided to have a "cherry chapstick" worthy moment backstage at the 2007 MTV Movie Awards. Will Ferrell and Sacha Baron Cohen reenacted their Talladega Nights liplock at the 2007 MTV Movie Awards. 2005 Best Kiss winners Rachel McAdams and Ryan Gosling need to add an extra entry for this notebook worthy kiss. Carmen Electra won Best Kiss in 2004 and since co-stars Owen Wilson and Amy Smart weren't present, she grabbed the first blonde available... Paris Hilton. At the 2004 Movie Awards Carmen Electra couldn't forget about the other presenter, Snoop Dogg, who seemed more than happy to test out her award winning skills. Before Katy Perry there was t.A.T.u who decided to put their own spin on "kissing a girl and liking it" during their performance at the 2003 MTV Movie Awards. At the 2001 Movie Awards Sean Patrick Thomas and Julia Stiles may have "saved the last dance"... but they never said anything about a last kiss. Sarah Michelle Gellar may have been "cruel" to Selma Blair on screen but her lips tell another story during the 2000 MTV Movie Awards. Ben Affleck silences "Bob" aka Kevin Smith with a dramatic kiss when presenting Best New Filmaker in 1999. Ben Stiller and Puffy the Dog may have won Best Fight at 1999's MTV Movie Awards... but it seemed like the right time to kiss and make up. Catherine Zeta-Jones decided to live "la vida loca" for a spicy second with Ricky Martin at the 1999 MTV Movie Awards. As if! Jim Carrey doesn't seem too "clueless" when it came to stealing a kiss from Alicia Silverstone at the 1997 MTV Movie Awards. 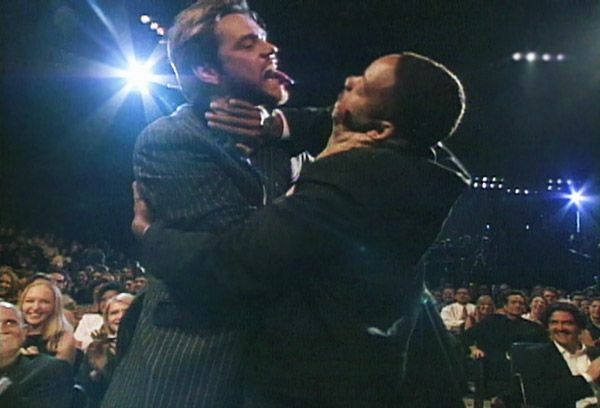 Will Smith was about to accept his Best Kiss Award at the 1997 MTV Movie Awards... but Jim Carrey wanted to see if he lived up to the title. Matthew Ashford couldn't resist this desirable "species" called Natasha Henstridge as they accepted their award together for Best Kiss in 1996. John Lovitz wanted to see how "friend"ly his co-host Courteney Cox was at the 1995 MTV Movie Awards. Chris Isaak thought it would be funny to sneak a kiss from fellow presenter Cameron Diaz at the 1995 MTV Movie Awards...however she did not think it was so funny. Pauly Shore and Lara Flynn Boyle pucker up at the 1994 MTV Movie Awards. Clearly it's hard not to fall for The Weasel. Hold onto your hat Marisa Tomei! This Chili Pepper, Anthony Kiedis, created some sparks with a "red hot" kiss as he presented at the 1992 MTV Movie Awards. 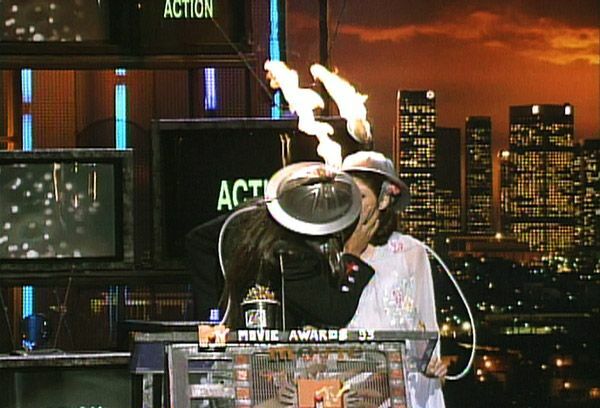 Tia Carrere and Luke Perry presented at the very first MTV Movie Awards in 1992 starting the kiss movement.